Use transition to animate changes to an element's style. 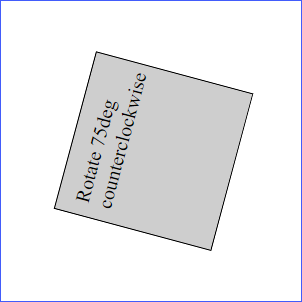 Use transform to move, scale, rotate, and skew elements. The transition property provides a way to animate elements between two states. Different states can be set with pseudo-classes (e.g., :hover, :active, etc.). transition is shorthand for transition-property, transition-duration, transition-timing-function, and transition-delay. all - The default value. All animatable properties will transition from the first state to the second state. none - No properties will transition. A single property (e.g., transition-property: margin) or a comma-delimited list of properties (e.g.,transition-property: margin, padding, color). transition-duration sets the amount of time that the transition will take. It takes a positive time value in seconds (s) or milliseconds (ms). The default is 0s. ease - The default value. The transition speeds up towards the middle of the transition and slows down at the end. linear - The transition maintains the same speed throughout the transition. ease-in - The transition starts slow and accelerates until the end. ease-out - The transition start fast and decelerates until the end. ease-in-out - The transitions starts slow, accelerates and then decelerates at the end. transition-timing-function also takes the cubic-bezier() (https://developer.mozilla.org/en-US/docs/Web/CSS/timing-function#The_cubic-bezier()_class_of_timing_functions) and steps() (https://developer.mozilla.org/en-US/docs/Web/CSS/timing-function#The_steps()_class_of_timing_functions) function values, which give more control over the precise motion of the transition. transition-delay sets the time to wait before the transition starts. It takes a positive or negative time value in seconds (s) or milliseconds (ms). If a negative value is set, the transition will start immediately from the place it would be if it had already been running for the given amount of time. The default value is 0s, which means that the transition starts immediately from the beginning. If a positive value is set, the transition will not start for that amount time. Curabitur tristique odio ac sem congue luctus. You will need to open TransformsTransitions/Demos/transition.html in the browser and interact with the page to see the transition effects. We added transition effects to the links at the top when they are hovered over. We added transition effects to the article elements when they are the target. article1 is the target in the image above. transform also takes the keyword none, which means no transforms should be applied. The matrix() function (https://developer.mozilla.org/en-US/docs/Web/CSS/transform-function/matrix) is an all-in-one function that can do any transform, but its notation is exceedingly complicated, is not author-friendly, and is not as commonly used as the other functions. 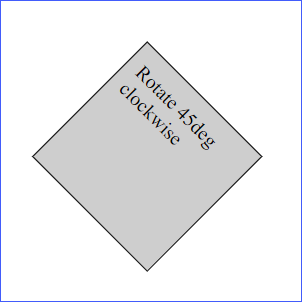 transform also takes 3D function values (https://developer.mozilla.org/en-US/docs/Web/CSS/transform-function#Syntax) used to create 3D transforms. These are not commonly used. These examples can be found in TransformsTransitions/Demos/transform-examples.html. 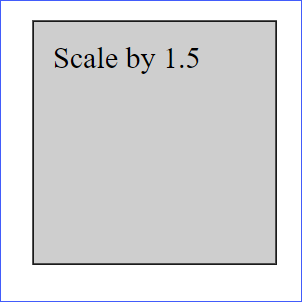 The scale() function takes one or two number values without units. 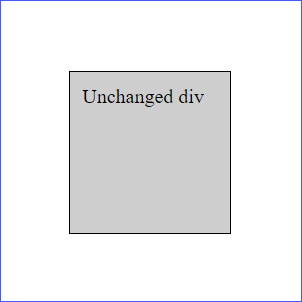 If negative values are used, the element is flipped. 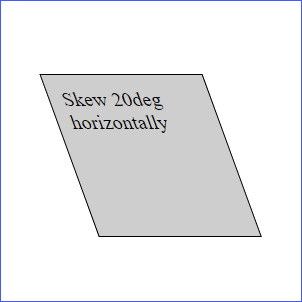 If one value is used, it is the scaling factor both horizontally and vertically. 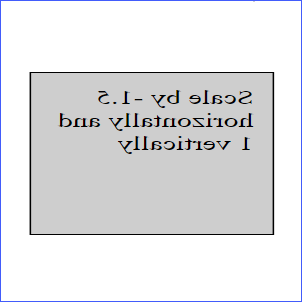 If two values are used, the first is the scaling factor horizontally and the second is the scaling factor vertically. The skew() function takes one or two positive or negative angle values in degrees (deg), gradians (grad), radians (rad), or turns (turn). If one value is used, it skews the element horizontally. 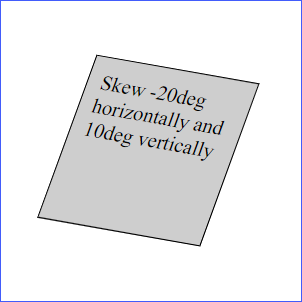 If two values are used, the first value skews the element horizontally, and the second value skews the element vertically. The translate() function takes one or two positive or negative length values. Positive values move the element right or down, and negative values move the element left or up. If one value is used, it moves the element horizontally. If two values are used, the first value moves the element horizontally, and the second value moves the element vertically. You can see more uses of transform in the following demo. Note that you will also see more examples of transition and see transform and transition used together. You will need to open TransformsTransitions/Demos/transform.html in the browser and interact with the page to see the effect of these styles. We added transform and transition effects to the article elements when they are the target. We added transform and transition effects to the img and a elements within the article elements. Websites rarely use this many transforms and transitions; however, the demo gives you a sense of what can be accomplished with them. In this exercise, you will continue to work with the Running Blog page. Open TransformsTransitions/Exercises/running-blog.html in your editor. 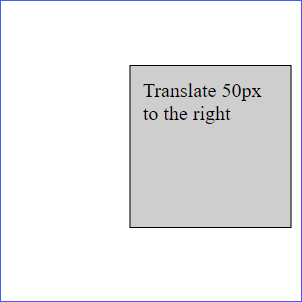 Open TransformsTransitions/Exercises/blog-styles.css. 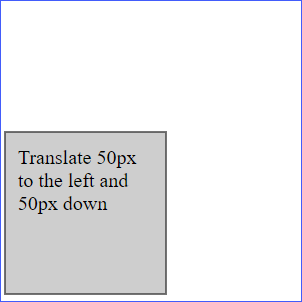 This is the stylesheet from the solution to the Positioning exercise. Feel free to continue working from your own stylesheet. 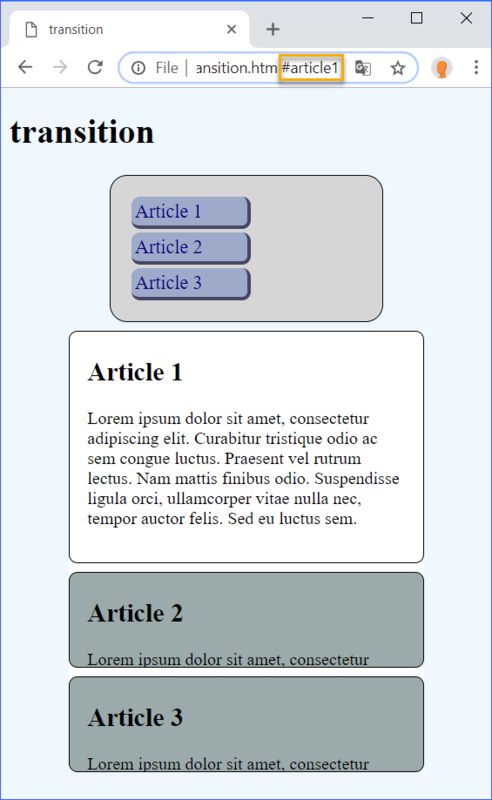 Using your new knowledge of transforms and transitions add some styles to this page. The object of this exercise is to practice using the properties covered in this lesson. Also, feel free to add or change any other properties that you know. When you are done, open running-blog.html in your browser to see the results. You are welcome to go back to the code and continue to work. Make the tiny runner move right, flip and come back when it is within the target. Skew the back-to-top links when they are hovered over. Transition the width and color of the articles in the all section when they are the target. 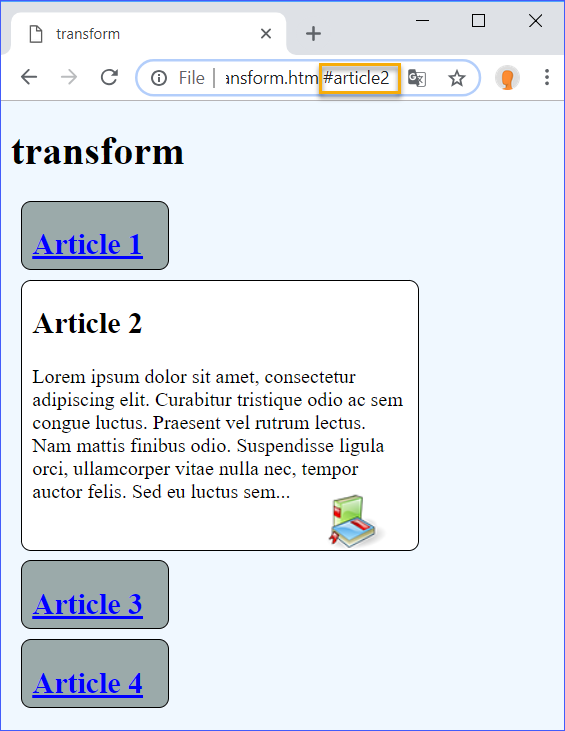 You will need to open TransformsTransitions/Solutions/running-blog.html in the browser and interact with the page to see the transform and transition effects we added.